CINCINNATI -- A building that was once part of the historic Christian Moerlein Brewing Co. complex in Over-the-Rhine will become home to a new craft brewery and distillery this summer. The yet-to-be-named brewery and distillery will open inside the former Moerlein icehouse at 108 Henry St. by June or July, according to two of its co-founders, David Berger and Bryan Becker. Berger's wife, a family friend Damon Kresa and head brewer Tom Cox are also partners in the venture, which will feature a tap and tasting room, event space, 20-barrel capacity brewhouse and copper stills. The group is working with students in a senior-level marketing class at Miami University to develop a strategic business plan. Students are helping to choose the brewery and distillery's name, building its website, creating logos, launching social media and researching future distribution of its beers and spirits. "To be able to be hands-on in a real-life situation, to work alongside an actual company, is just something you can’t get from a traditional classroom," said Angela Cortright, the project manager responsible for coordinating the work of her fellow marketing students. "We’re basically applying everything we learned the past four years in this capstone class." Cortright said the class hopes to announce the brewery and distillery's official name by the first week of March. Meanwhile, the business owners are working to remodel the five-story icehouse, which was built in 1891. They installed the brewhouse and a test still on the building's first floor in January. 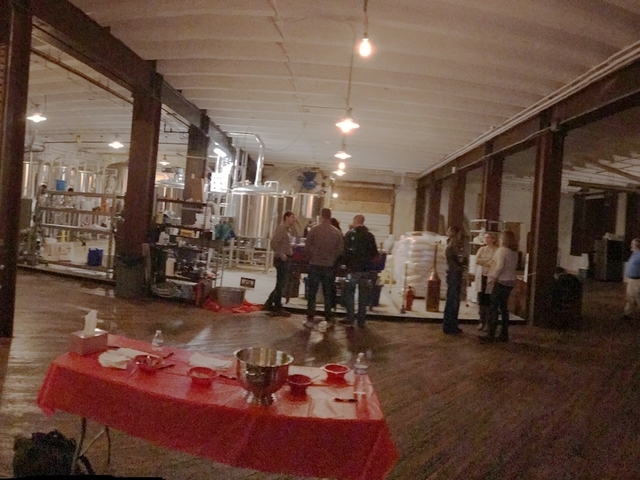 The tasting and tap room will be located on the first floor as well. The partners received their license from the Ohio Division of Liquor Control on Feb. 6 to begin brewing and distilling on-site. The distilling portion of the business will take advantage of changes made to Ohio's liquor laws last year, allowing distilleries to sell cocktails made from their spirits on-site. Previously, Ohio distilleries could serve only small samples of their products during tours. The distillery will make gin, vodka and whiskey alongside barrel-aged bourbon. Using research gathered by the Miami students, the owners hope to start self-distributing their beer to local bars before the taproom opens. 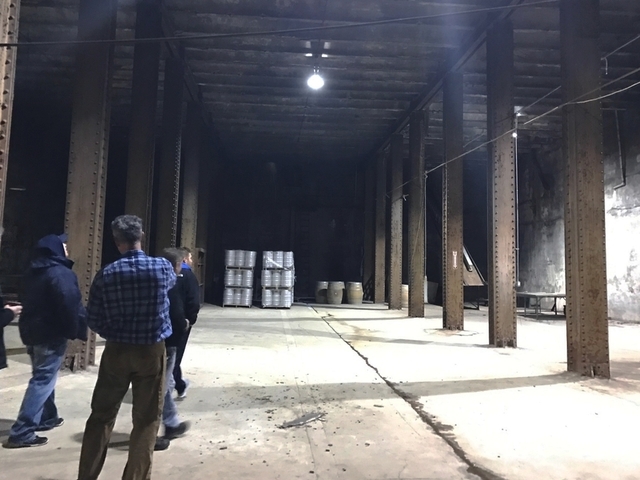 The owners plan to turn the building's two-story-deep basement, which Moerlein used to store its beer, into an event and barrel-aging space. David Berger, left, gives a tour of the former Christian Moerlein icehouse basement. The icehouse building is located about a block away from the former Moerlein bottling plant, which is now home to Rhinegeist Brewery at 1910 Elm St. 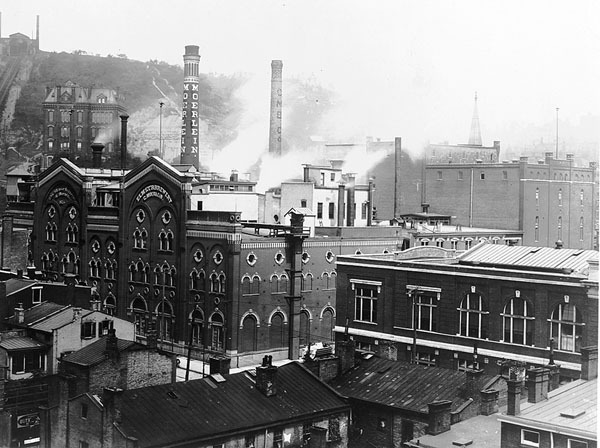 Prohibition forced the original Christian Moerlein Brewing Co. to cease its entire brewery operation in 1919. The Moerlein icehouse can be seen near the top right corner of this photo taken in the early 1900s. Berger said his family purchased the property in 1995 and leased it out to other businesses until a couple of years ago. “We were real involved in Over-the-Rhine for 18 years,” said Berger, whose family operated a cigar business in Cincinnati for seven generations. When the last tenants left the Henry Street building, Berger said it made sense to enlist his friends and set up the distillery there. Becker, a chemical engineer, said the group originally planned to open only a distillery in Over-the-Rhine. When the partners started outlining their initial plans, though, they realized the potential pitfalls of focusing solely on making bourbon. That's when they decided to make craft beer as well. "When we came back and looked at that, we realized you utilize similar equipment for both processes," Berger said. Berger then contacted Cox, an award-winning home brewer and member of the Terrace Park Brewing Co. cooperative, to head the beer-making operation.